Russian President Vladimir Putin claims that he had limited personal interaction with former U.S. National Security Adviser Michael Flynn, when asked by NBC's Megyn Kelly in an exclusive interview about the nature of their relationship — and a widely circulated December, 2015 photo that shows the two sitting next to each other at dinner during an event to celebrate Russian TV network RT (Russia Today). “You and I, you and I personally, have a much closer relationship than I had with Mr. Flynn,” Putin told Kelly in Russian, translated to English. “You and I met yesterday evening. You and I have been working together all day today. And now we're meeting again. “When I came to the event for our company, Russia Today, and sat down at the table, next to me there was a gentleman sitting on one side,” Putin continued. “I made my speech. Then we talked about some other stuff. And I got up and left. And then afterwards I was told, ‘You know there was an American gentleman. He was involved in some things. He used to be in the security services' ... that's it. I didn't even really talk to him... That's the extent of my acquaintance with Mr. Flynn." 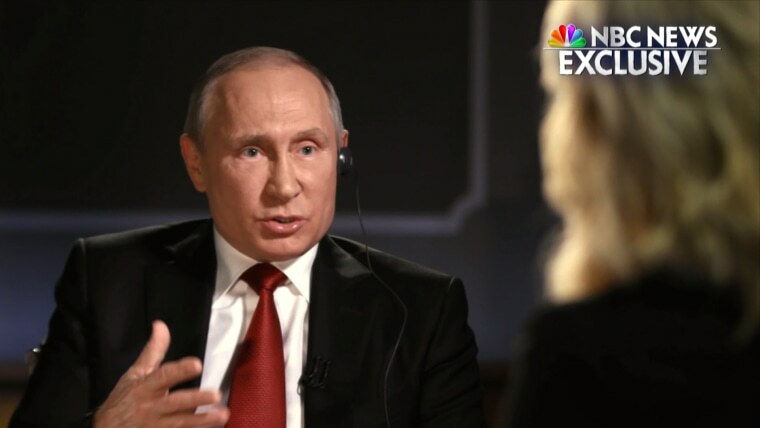 Putin made the comments during an exclusive interview that will air on June 4th at 7 p.m. ET/6 p.m. CT during the premiere of "Sunday Night with Megyn Kelly" on NBC. Retired Lt. Gen. Flynn served as an adviser to Trump’s presidential campaign, and then served as President Donald Trump’s national security adviser in the White House for less than a month before he was fired for what the administration said was lying about his conversations with Russian Ambassador Sergey Kislyak to Vice President Mike Pence. Flynn was paid $45,000 to speak at the gala, and was placed in the "seat of honor" next to the Russian president. "It is not coincidence that Flynn was placed next to President Putin," Michael McFaul, U.S. ambassador in Moscow from 2012 to 2014 and now an NBC News analyst said in April. "Flynn was considered a close Trump adviser. Why else would they want him there?" The FBI is now conducting an investigation, led by former FBI Director Robert Mueller, into Russian attempts to interfere in the last U.S. presidential election, including whether there could have been any connection to associates of the Trump campaign. NBC News has reported that Flynn is considered a formal “subject” of the Russia probe, which includes a deep look at his business interests, though no evidence has surfaced into the current public sphere that links him to the election meddling effort and his lawyers say he did nothing wrong. Senior U.S. intelligence officials have also told NBC News that they believe Putin was personally involved in the Russian effort to interfere with the U.S. election and that the Russian president personally directed how hacked material was used to try to damage Democrats. Elsewhere in his interview with Kelly, Putin claimed that "a child" could have hacked the U.S. election — and also alleged Russia may have been framed.